We’ve profiled 2LOUD’s work for almost two years now. From day one, builder ‘Max’ Yicheng has consistently delivered elegant and harmonious machines from his one-man-shop in Taipei, Taiwan. In fact, his work is so tasteful and restrained, the ‘2LOUD’ moniker borders on ironic. Those are rare traits in today’s custom world, and they’re why we keep a close eye on Max’s output. 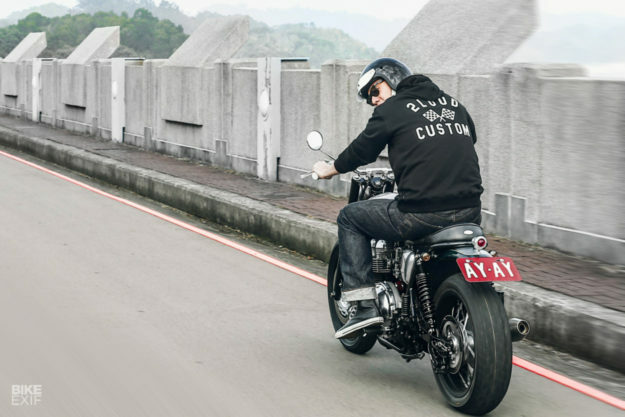 And this custom Triumph Bonneville exemplifies the 2LOUD ethos. It’s so subtle that you’d be tempted to pass it over—but look closer, and you’ll discover a host of cracking details and useful upgrades. 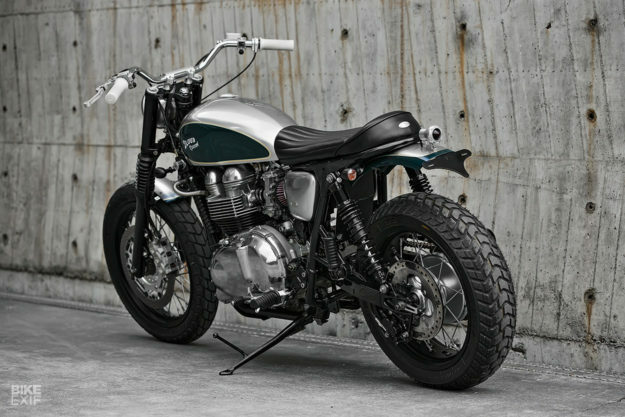 It belongs to the same customer that commissioned the first 2LOUD bike we ever featured: a Suzuki TU250. 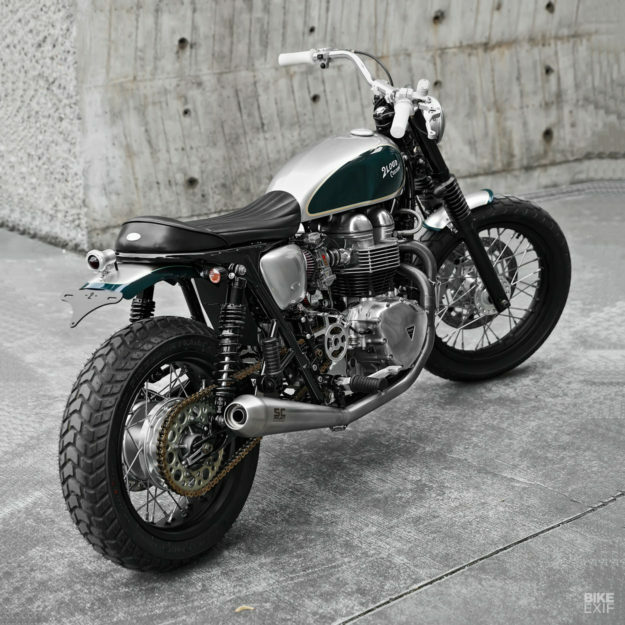 Like the little Suzuki, the 2003-model Bonneville had to be transformed into a stylish street tracker—but without losing too much of its original style. It also had to fit the owner’s lofty 6’3” frame. So Max has fitted longer-than-stock Öhlins shocks, to lift the rear a touch. He’s kept the original front suspension though, but serviced it and upgraded the oil. The wheels were swapped out for a set of tubeless spoked items, from Alpina in the UK. The Bonneville’s known for lazy handling, partly thanks to its stock 19” front wheel, so Max has opted for an 18” front matched to a wider (160) rear. The new rims are wrapped in Pirelli MT60RS tires, chosen for both their look and their grip on varying surfaces. Max also upgraded the brakes with a full system from the legendary Swedish firm ISR. 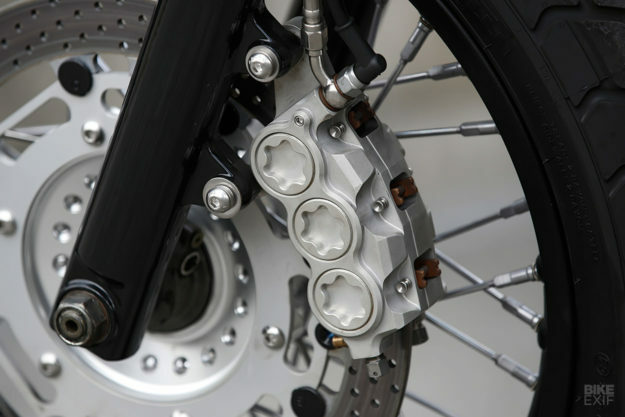 That included new calipers and discs, and new brake and clutch levers, with integrated handlebar switches. Moving to the motor, he’s replaced the clutch with a new one from FCC, and installed a full set of new gaskets. The rest of the motor upgrades are external; there’s a pair of FCR37 flatslide carbs, and a British Customs airbox removal kit with K&N filters. 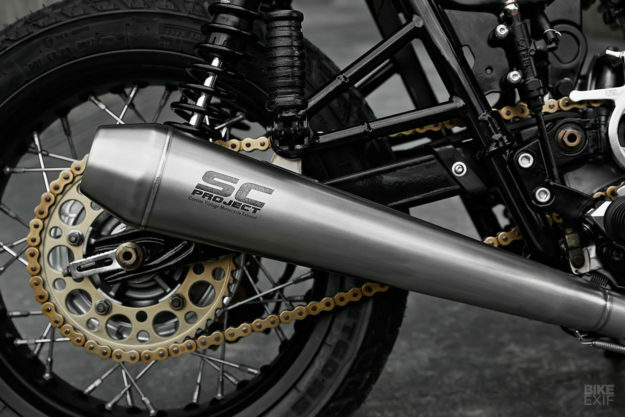 It’s matched up to a full exhaust system from SC-Project. Despite the number of bolt-on goodies, Max’s real strength is with sheet metal. But even here, he didn’t go overboard. 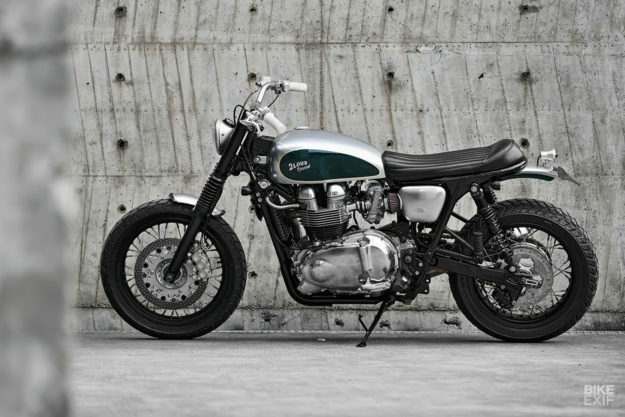 Instead, he’s cut-and-shut the stock Bonneville fuel tank for a slimmer effect, and added a vintage-style seam on top. His attention to detail is sublime—like the drillium front tank mounts, and the hand-made fuel tap. Other custom pieces include the side covers, and a pair of stubby aluminum fenders. Max also trimmed and looped the subframe, capping it off with a genuine leather saddle that’s just long enough to accommodate two people. 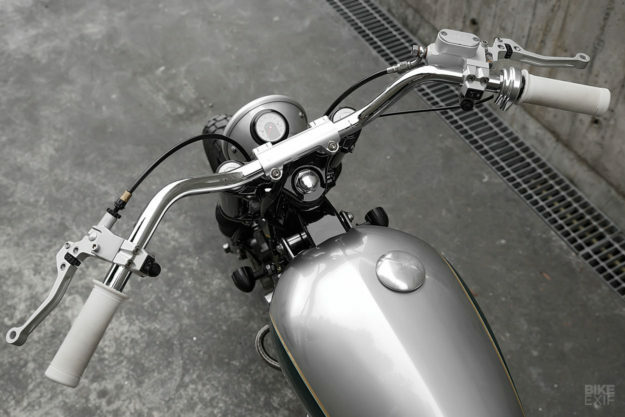 To clean up the cockpit, Max purchased a headlight, with an integrated Motogadget speedo, from the French custom shop BAAK Motocyclettes. (The turn signals came from BAAK too). 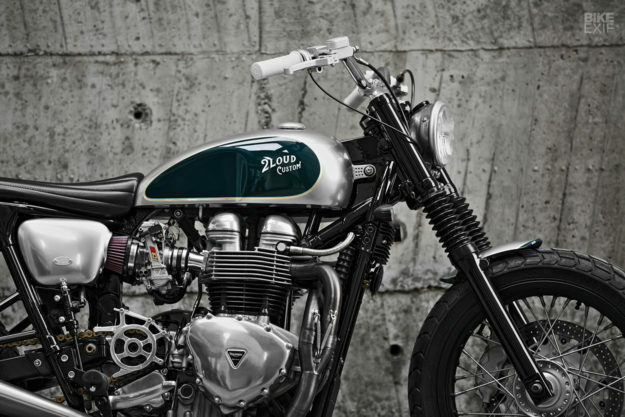 New tracker-style handlebars from GOODS in Japan were fitted, along with Biltwell Inc. grips. The handlebar clamps are particularly interesting; they’re a hinged design, CNC-machined to Max’s specification. All of the switch wiring runs inside the bars, making for a super sano setup. As usual, small hand-made parts like the headlight mount and license plate bracket carry the 2LOUD ‘2’ motif. Final touches include an Evotech bash plate, an LSL sprocket cover, and a tail light from MS Taiwan. Max replaced the chain and sprockets too, for good measure. Everything’s wrapped up in a livery as subtle as the rest of the bike. It works off a metallic silver base, with sections of green, and punctuated by gold foil pin striping. Max designed the scheme, then handed it over to Line&Circle Custom Studio to execute. The frame and swing arm were treated to a tough new coat of gloss black. 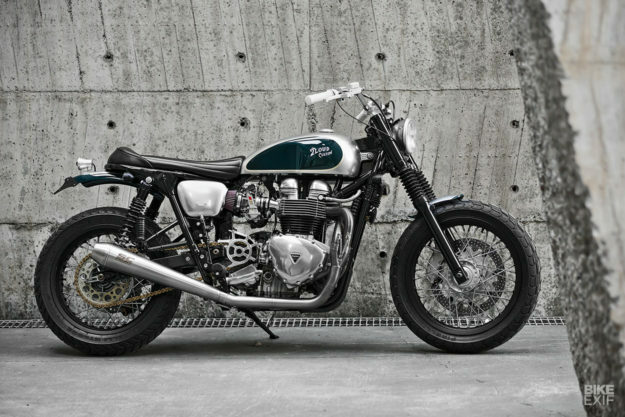 A stock Bonneville is already an attractive machine, but Max’s version is downright gorgeous. 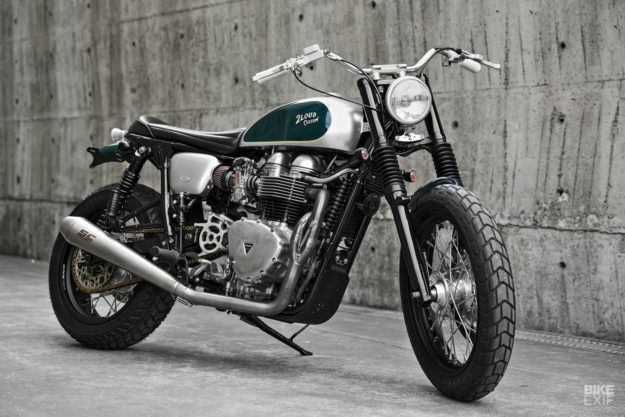 He’s kept the Triumph’s classic appeal, made it look even more retro, and balanced it out with a stacked list of performance upgrades. And he’s done it without vintage tires or even an inch of pipe wrap. It’s another feather in 2LOUD’s cap—and another reason to keep an even closer eye on this powerhouse shop.